Today we finally made it across to Africa. Sudden dash from the hotel this morning as 10 o'clock sailing was canceled and we dashed for the 9 sailing, made it with a good 2 minutes to spare. Usual form filing and much stamping of bits of paper and then into Africa and sit in a customs shed. Pretended not to understand when asked for the original copy of the registration document then more stamping of bits of paper and through we went. Proceeded to get lost in the murder death and mayhem of Moroccon driving but eventually made it out of Tanger. Very scenic drive down including getting mixed up in a local funeral, parking with the taxis in the market and eating fried squid in a 'local' restaurant. We now know in Morocco you eat and in a Restaurant and drink in a cafe and never the Twain shall meet. 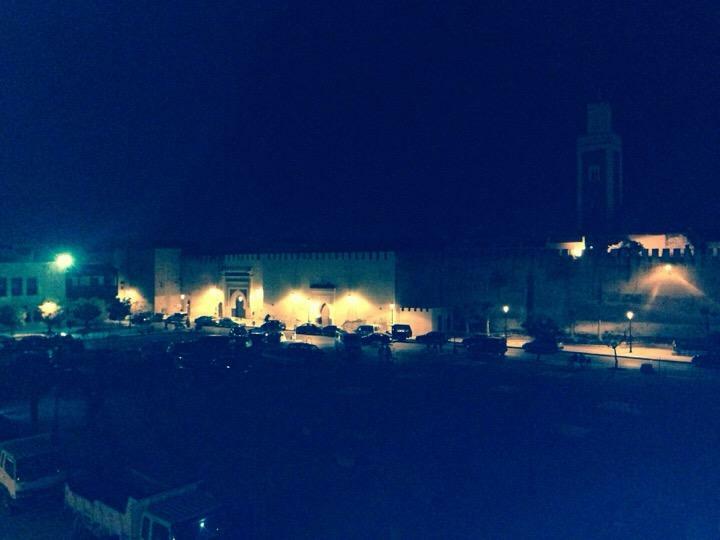 Arrived in Meknes with a drive inside the city walls and now drinking beer on the roof top. Tomorrow we have camping !!!!! Patsy Enjoy your last night in a comfortable bed ! Mum I am breathless at the rate you are going about this "holiday". But, enjoying all your blogs. Try to remember you are on a camping fun holiday ....not Boot Camp!!! Jackie Boot camp?! They haven't stopped eating! Ruth Wastell Jackie, if they get lost boots might be on the menu.